FC Barcelona beat Atlético Madrid 2-1 in the first act of what’s proving to be an absolute humdinger of a Copa del Rey semi-final. With a 2-0 lead at half-time, Barça fans could have been forgiven for starting to believe that the second leg was going to be a mere formality. But an impressive response from the home side after the break cut that lead in half, and although the blaugrana are still very much on the front foot, their place in the final is anything but decided. Two-legged knockout matches between these two teams have been grippingly tight affairs in recent seasons, and away goals can make all the difference. And the game was barely six minutes old before Barça already had one in their account – and what an away goal it was. Following a lunging interception from Javier Mascherano, Luis Suárez collected the ball on the halfway line and set off on a powering run, beating four defenders for pace and setting himself up for the deftest of finishes. The action was living up to everything you could ask of a cup semi-final and more. Atlético reacted to the early setback strongly. Diego Godín headed wide, Gerard Piqué beat Antoine Griezmann to a surefire goal opportunity… but despite Atlético’s pressure every time the ball landed at the feet of one of the MSN a second goal for Barça looked a very distinct possibility. Goalkeeper Moyá saved Neymar Jr’s finest chance, while Suárez should probably have had a go himself on 28 minutes rather than unselfishly try to pick out Leo Messi at the far post. Five minutes later Ivan Rakitic had greater fortune seeking out the Argentinian and boy did Messi make the most of it! The greatest left foot football has ever seen delivered a master-strike from the edge of the area, the ball bounding unstoppably off the post and into the back of the net. Atlético were gobsmacked. Barça were already two goals to the good and were still hungry for more. But the home side weren’t done yet. 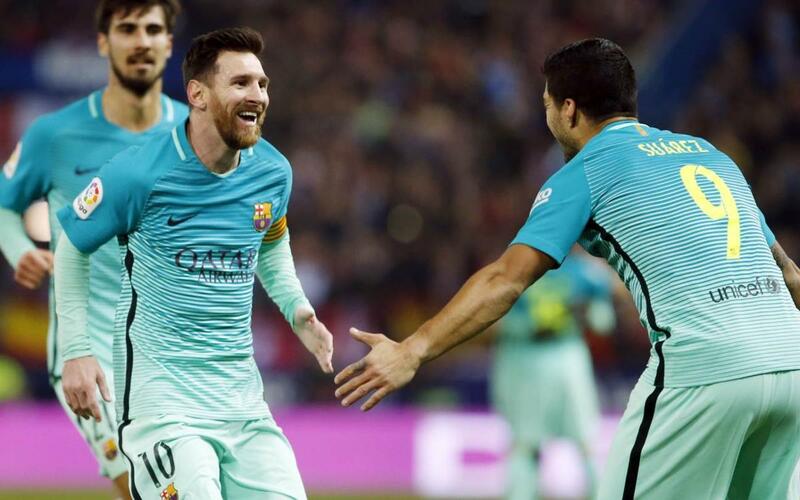 The second half opened with a red-and-white surge on the Barça goal and it didn’t go unrewarded. On 59 minutes, Godín rose to meet a free kick and his header was met by another from Griezmann and the Calderón, which in all fairness had never once fallen silent, was now well and truly back to life. Moments later the Frenchman was perfectly poised for a second and Barça had Jasper Cillessen to thank for keeping their lead intact. Intensity, intensity, intensity. Barça struck back. Messi’s free kick was as brilliant as Moyá’s diving save, Neymar sent another chance skyward while Gameiro and Torres both came within a whisker of scoring at the other end. And so it continued. If anything, the last quarter of an hour was the most frenetic of all, and most of the danger was in and around Cillessen’s area. The Dutch stopper himself was providential – and there were gasps of frustration all around the ground as chance after chance went begging for Atlético Madrid. Barça held on and will be taking a more than promising 2-1 lead into the second leg at the Camp Nou next week. But if tonight’s drama is anything to go by, there could still be some twists to come in a gripping tale.